Just yesterday, Special Counsel Robert Mueller made a Trump-Russia court filing which all but declared that, one way or the other, he had already gained the upper hand against Donald Trump’s newly appointed Acting Attorney General Matthew Whitaker. Now comes late breaking news about Whitaker’s financial records which should be enough to finish him off entirely. 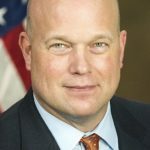 So what is CREW about to find in Whitaker’s financial disclosures? We don’t know yet, but there’s no question it’ll be ugly. The White House wouldn’t have tried to keep his disclosures from becoming public knowledge, and taken the extreme step of altering them five times, unless there was something in there that Trump and Whitaker really didn’t want to become public, for fear it would finish Whitaker off. Here’s the big question: is Robert Mueller confident about the Matt Whitaker thing because he’s already managed to scare Whitaker into getting out of the way of the investigation, or because Mueller knows he has enough on Whitaker to crack him like an egg if necessary? Either way, Whitaker is done. Stick a fork in him.